I really should get some sleep, but I have to jot down some thoughts about class tonight first. This was one of the most fulfilling days that I have experienced as a college instructor, thus far. The chapter that we covered is probably the driest material in the entire textbook: the judicial system. There are several Latin terms, a lot of procedural dos and don’ts, and it is difficult to make it sound interesting. It is important; don’t get me wrong … just not particularly riveting. I took my lecture notes with me to lunch earlier today, to spend some more time prepping before the 6pm class. As I was looking back over a few sections, this picture began to piece together in my head. I thought it might be corny, but it was worth a shot! Using the March Madness basketball theme, I sketched a basketball court for the University of Common Law whose motto is “stare decisis.” The “C” in center court stands for Constitution. The referee has “jurisdiction,” while the two coaches are yelling, “Justiciable controversy!” and “Standing to sue!” to have their issues heard. 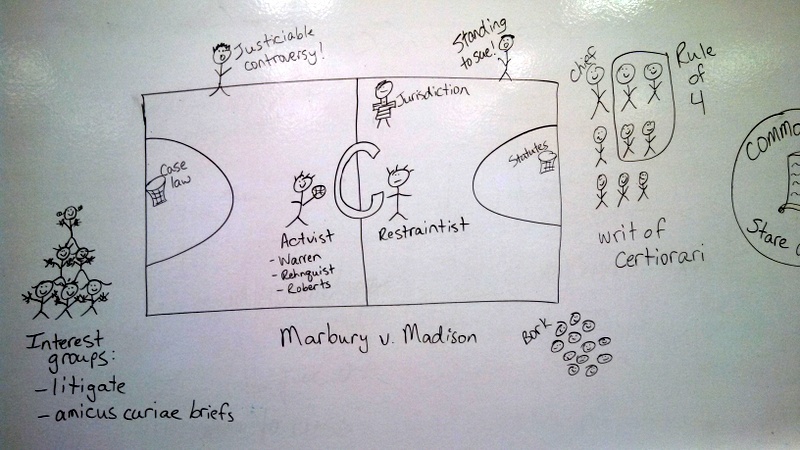 The player with the ball is “activist,” because he’s on the offense, and the player who is just standing there is “restraintist.” The two baskets represent types of precedent that the judiciary weighs when making decisions: case law and statutes. The cheerleaders represent interest groups on the side of the court. The Supreme Court justices are on the right (there are 9), and four of them are circled, since that’s how many have to agree to hear a case. The Senate is in the lower right corner, keeping an eye on the court and saying, “Bork” because they might not want to confirm one of the judges. On the far right, next to the Common Law seal (with a scroll to symbolize the Constitution), I put sample brackets to represent the U.S. District Courts (there are 94), U.S. 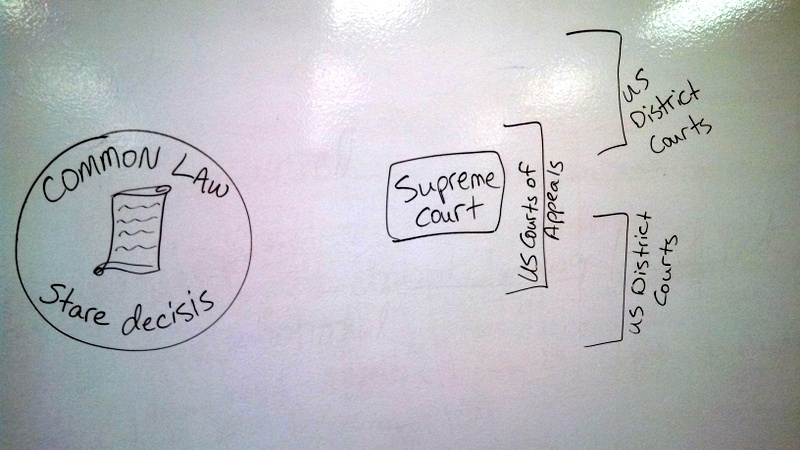 Circuit Courts of Appeals (only 13 of these), and finally the end of the line: the Supreme Court. I really liked being able to reference the board instead of just the PowerPoint slides as we went through the material, and I think it helped to put some of the concepts into practical (albeit silly) terms. I was pleased enough that the lesson went over better than I had hoped, but that isn’t even the best part of the class. One of the students who is doing really well in the class came up to me at the end and asked for my advice about possibly switching his major to political science. Wow! I know it isn’t just because of my awesome teaching (lol), but I’d like to think that I had a little bit of influence toward his interest in the subject! 🙂 It made my day.